, an ingenious English poet, was descended from a family in good repute among the dissenters, and had his education in some of the sects into which that body is divided. He was a man of approved probity, and sweetness of temper and manners. His wit abounded in conversation, and was never known to give offence. 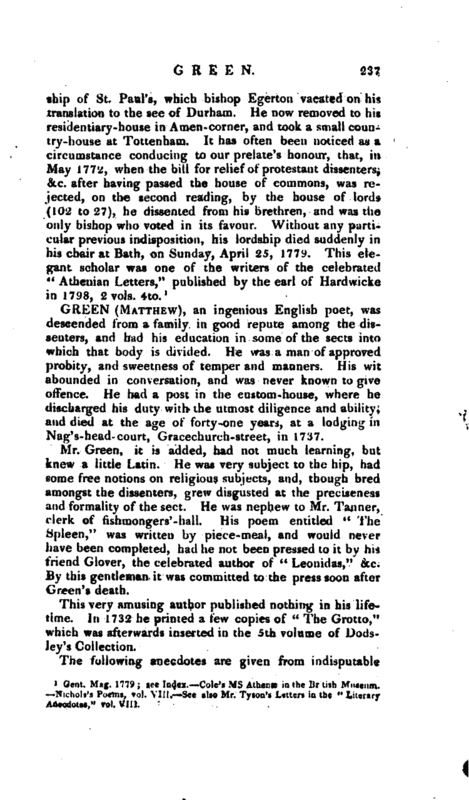 He had a post in the custom-house, where he discharged his duty with the utmost diligence and ability, and died at the age of forty-one years, at a lodging in Nag’s-head-court, Gracechurch-street, in 1737. Mr. Green, it is added, had not much learning, but knew a little Latin. He was very subject to the hip, had some free notions on religious subjects, and, though bred amongst the dissenters, grew disgusted at the precisent-s* and formality of the sect. He was nephew to Mr. Tanner, clerk of fish mongers’ -hall His poem entitled “The Spleen,” was written by piece-meal, and would never have been completed, had he not been pressed to it by his i’riend Glover, the celebrated author of “Leonidas,” &c. By this gentleman it was committed to the press soon after Green’s death. This very amusing autbor published nothing in his lifetime. In 1732 he printed a few copies of “The Grotto,” which was afterwards inserted in the 5th volume of JJodsley’s Collection. The following anecdotes are given from indisputable | authority: Mr. Sylvanus Bevan, a quaker and a friend of Mr. Green, was mentioning, at Batson’s coffee-house, thaty while he was bathing in the river, a waterman saluted him with the usual insult of the lower class of people, by calling out, “A quaker, a quaker, quirl” He at the same expressed his wonder, how his profession could be known while he was without his cloaths. Green immediately replied, that the waterman might discover him by his swimming against the stream. The department in the customhouse to which Mr. Green belonged was under the controul of the duke of Manchester, who used to treat those immediately under him once a year. 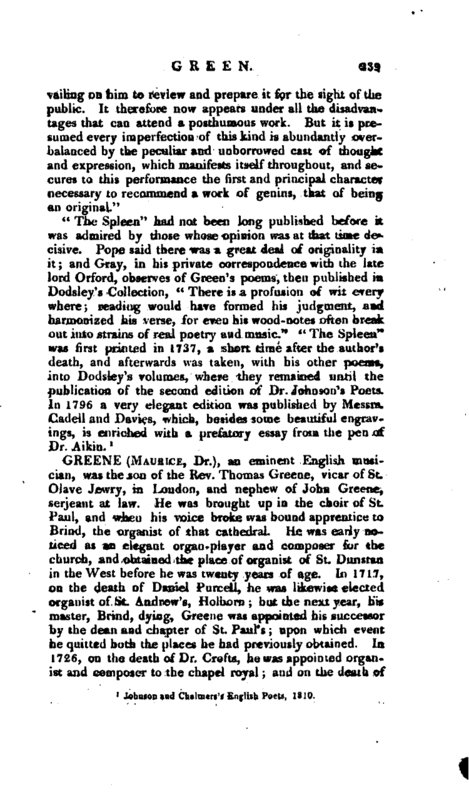 After one of these entertainments, Mr. Green, seeing a range of servants in the hall, said to the first of them, “Pray, sir, do you give tickets at your turnpike” In a reform which took place in the custom-house, amongst other articles, a few pence, paid weekly for providing the cats with milk, were ordered to be struck off. 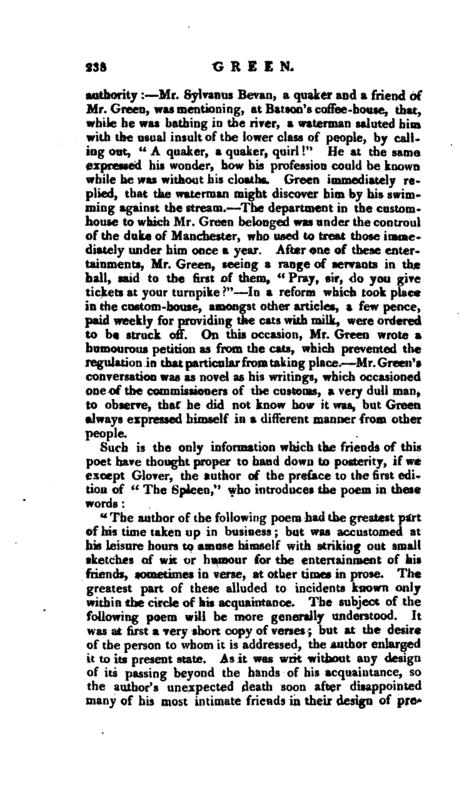 On this occasion, Mr. Green wrote a humourous petition as from the cats, which prevented the regulation in that particular from taking place. Mr. Green’s conversation was as novel as his writings, which occasioned one of the commissioners of the customs, a very dull man, to observe, that he did not know how it was, but Green always expressed himself in a different manner from other people. 1 Johnson and Chalmers’s English Poets, 1810.